Trust is the new currency for engaging with today’s self-obsessed consumer and brands will need a combination of credibility, reliability and intimacy if they’re going to win them over. That’s the view of PR Newswire’s CMO, Ken Wincko, who spoke during the Marketo Marketing Nation Summit about how his organisation is looking to build next-generation customer experiences. Wincko said today’s consumers don’t just have higher expectations, they’re also driven by a sense of entitlement. This is particularly the case with the emerging Gen Z generation, who are also sophisticated digital and technology users. “Credibility means expertise from every person who interacts with a prospective or current buyer,” he said. “That could be sales, service, marketing, or a third party. Wincko also claimed marketers continue to spend too much time talking about themselves and their brands, products and services. Designing customer experience tends to be considered in terms of one-to-one and personalisation. But Wincko said marketers now need to think in terms of network-to-network and focus on building advocacy in order to be community-centric. For Wincko, key elements to the right customer interactions are being contextual, compassionate, connecting across the entire lifecycle and channel mix, convenience and consistency. And to achieve this, he pointed to the need to keep harnessing emerging technologies. Some on the near-term horizon that could be relevant depending on industry include wearables, virtual reality, smart appliances and the Internet of Things, he said. To tap into moments that matter for customers, PR Newswire has made a number of changes to the way its marketing team operates. Wincko grouped these into the key pillars of content, people, process and technology. Content is about identifying the informational needs that will take you to that next action, he said. PR Newswire has also changed the types of people it hires and what it asks them to do. For example, Wincko said it focuses on people who are credible with content, data and technology. “These are what I call ‘marketing athletes’and they have to be flexible to get that future speed to market,” he said. When it comes to process, PR Newswire has introduced agile marketing processes to gain that flexibility. “Speed is the game, so you have to think about how you’re coordinated across the organisation,” Wincko said. On top of this, PR Newswire has created anintegrated tech stack, based on Marketo’s marketing automation platform, to record every interaction and coordinate these across all customer touchpoints including digital, events and content.This is all enabled by buyer insights and data-driven decision making into who customers are, the type of organisation, their role, what stage of the lifecycle they’re in and what their goals are, Wincko said. All this is upping PR Newswire’s effectiveness, and Wincko highlighted a 360 per cent increase in marketing influenced revenue last year, a figure it’s on track to double this year. The final piece most organisations forget about is organisational alignment, he said. To help, PR Newswire has adopted Tableau’s data visualisation tools to improve decision making across the business. “When you think about customer experience, it requires operational thinking, which is cross-functional. 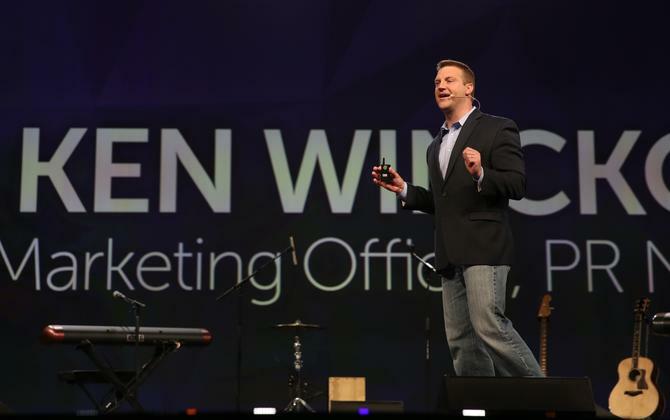 That’s marketing, sales and customer service all combined,” Wincko said. Imagine the buyer’s wants, rather than needs. “What are their desires? Ask what if, and what are the possibilities, then multiple it by two,” he said. Design for simplicity and flexibility. For Wincko, brands need to eliminate the paradox of choice. “Options are good but not too many, as it slows down the decision-making process,” he said. “When we went to market, we did our research and we built a lifecycle model, mapped our content, but buyers aren’t rational. What we found with data was some content worked well later in the cycle that we thought would work earlier, so you’ve got to also build flexibility into your processes. Empower teams to make decisions and assign customer experience responsibility cross-functionally. Wincko cited research that found only 46 per cent of frontline employees have a customer experience metric. To help, he advised assigning CX metrics for the entire organisation, such as Net Promoter Score. Set up the proper metrics. “A lot of call centres are worried about call time, whereas it’s more about time to resolution,” he said. “You also need to think about setting up goals, and the adoption rate of CX among employees and tracking that. Make it about trust. “Forrester predicts that by 2020, most boards will be asking to have a trust metric. Because that is what organisations are competing on – you’re competing on trust and customer experience,” Wincko added.